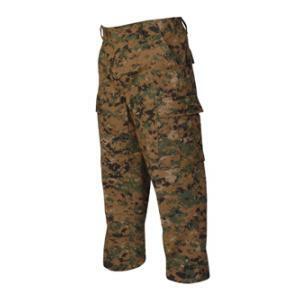 This BDU pant is made of a 65% polyester, 35% cotton twill blend. It has a 6 pocket design, 2 front slash pockets and 2 rear inserted pockets with snag proof pocket flaps, 2 pleated, bellowed cargo pockets with snag proof button flaps, 2 adjustable side tabs which are secured with 4 bartacks, a reinforced seat, reinforced knees with removable padding, 4 button fly closure, belt loops with 2" wide opening which are secured with two bartacks, and drawstring leg ties. US materials sewn overseas. These pants are not military issue.